Keywords: foams; hydrocolloids; review; healing; in-use characteristics; patient-centred outcomes. Foam and hydrocolloid dressings possess many of the characteristics expected of modern dressings. Recently, there has been an increase in the awareness of the need for clinicians involved in wound care to consider patient-centred outcomes such as avoiding dressing-related trauma and pain and minimising wound malodour. A review of the literature identified 11 randomised controlled trials that have been undertaken to compare foams and hydrocolloids in the treatment of a variety of wound types. 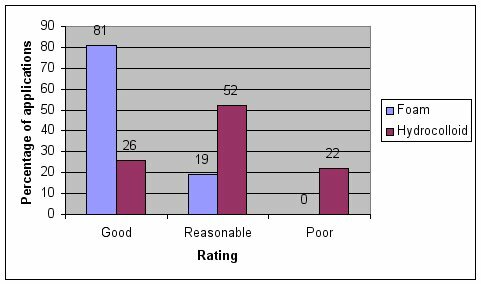 The review compared published data relating to a number of different products, possibly with very different performance characteristics. Only one study demonstrated a significant difference between the two dressing types in terms of wound healing rates (in favour of foam dressings). The majority of the identified studies indicate that, when used in the treatment of exuding wounds, foam dressings are superior to hydrocolloids in terms of exudate management, conformability, and ease of use, as well as being associated with less dressing-related trauma and pain, discomfort and malodour, although some studies demonstrated the two dressing types to be comparable in relation to these parameters. Appropriate dressing selection plays a key role in promoting and maintaining a wound environment that is conducive to healing. A wide range of modern products is available to clinicians. The objective of this study was to compare the clinical performances of the two most commonly used dressing types (foams and hydrocolloids) by means of a literature review. The literature search identified 12 articles describing the results of 11 comparative studies (all randomised controlled trials) in which a number of different foam and hydrocolloid dressings were evaluated on a variety of wound types. Outcomes measured in the studies included those relating to wound healing, in-use dressing characteristics and patient-centred outcomes. While recognising that both foam dressings and hydrocolloids satisfy many of the requirements of modern dressings, the available evidence suggests that the former are associated with better in-use characteristics and are more likely to meet the requirements of the patient, particularly in terms of preventing dressing-related trauma and minimising dressing-related pain, discomfort and malodour, in the management of exuding wounds. More than 40 years have passed since the principle of ‘moist wound healing’ was established . Since then, a large number of modern wound dressings have been developed and are now readily available for use. With such a plethora to choose from, it is vital that clinicians have an extensive knowledge of the properties of different dressing types, together with an understanding of the tissue repair process, in order to select those products that will help to deliver optimum wound care . As shown in Table 1, the ability to create (and maintain) a moist wound environment is just one of the many characteristics that an ‘ideal’ dressing should possess . The research and development of modern wound dressings has traditionally focused on healing as the major outcome of treatment, with little attention paid to other outcomes that are undoubtedly of concern to patients, such as wound-related trauma and pain, exudate management and malodour . In recent years, however, an increasing awareness of the need for clinicians to consider patient-centred outcomes has been very much in evidence. For example, the problems of wound-related trauma and pain are now well documented. In addition to increasing the size of wounds and delaying healing, trauma to the wound itself (caused by the removal of dressings that adhere to the wound bed), stripping of the peri-wound skin (caused by the repeated application and removal of adhesive dressings), and tissue excoriation and maceration of the peri-wound skin (as a consequence of inadequate management of exudate) can all exacerbate wound pain  and impair the quality of life of patients . Wound-related pain is also known to cause psychological stress which, in turn, can delay healing  . A recently published World Union of Wound Healing Societies consensus document  advises clinicians to select appropriate dressings to minimise wound-related pain based on wear time, moisture balance, healing potential and peri-wound maceration. Maintains the wound at the optimum temperature and pH. Exhibits effective wound cleansing (debriding) activity. Most modern dressings can be grouped into one of five different categories: alginates, films, foams, hydrocolloids and hydrogels. 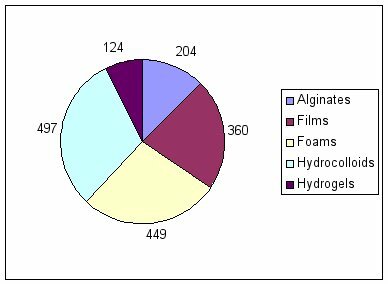 The two dressing types with the biggest share of the global moist wound dressings market are hydrocolloids and foams (Figure 1) . First launched in the early 1980s, hydrocolloids are now readily available in sheet, fibrous, paste and powder forms. The development of foam dressings (either polyurethane- or silicone-based) was aimed at overcoming the problem posed by the limited absorbency of film dressings. First introduced in the 1970s, foam dressings are now available in sheet form and cavity versions; they are widely used by clinicians in the management of a variety of different wound types. Based on observations reported in the literature  , Table 2 summarises the description, composition, key properties and uses of these two dressing types. Primary or secondary dressings on wounds (flat or cavity) with minimal to high exudate, where a non-adherent surface is important. Dressings for wounds with minimal to moderate exudate, including necrotic and sloughy wounds. Sheets may also be used as secondary dressings. When it comes to selecting dressings, clinicians should go further than simply considering the basic properties of different dressing types and, in doing so, should examine the published results of clinical evaluations of different products. By way of an example, this article provides a summary of the clinical evaluations that have been undertaken to compare the two dressing types that account for over half of the global moist wound dressings market. This paper summarises the results of a literature search that was undertaken to identify comparative data on which foam dressings and hydrocolloids can be compared in terms of their clinical effectiveness and safety. Parameters relating to wound healing, dressing performance and patient-centred outcomes are included. Searches of the bibliographic databases and authoritative internet sites listed in Table 3 were undertaken to identify published articles in which reference is made to comparative clinical data relating to the two dressing types. The scope of the search included clinical evaluations involving patients but excluded data generated from in vitro and animal studies. The following search terms were used: ‘wound(s)’ or ‘ulcer(s)’ or ‘burn(s)’; ‘foam(s)’ or ‘polyurethane(s)’; ‘hydrocolloid(s)’ and ‘clinical study’ or ‘clinical trial’ or ‘clinical evaluation’. The search was restricted to articles published between January 1970 and December 2008, written in English. In addition, manual searches of peer-reviewed journals of relevance to wound management were performed. Comparative clinical data relating to the two dressing types were identified in 12 articles, all of which describe the outcomes of randomised controlled trials (RCTs) involving patients with a variety of different wound types, for example leg ulcers of arterial  , diabetic , and venous aetiology       , pressure ulcers       and skin tears . Two of the articles refer to the same study  . Details of the study populations, therapeutic interventions, and outcome measures reported in the identified articles are presented in Table 4. Patient-centred outcomes (that is wound odour, trauma, pain at dressing removal and patient comfort/acceptability). The key findings of these studies are presented below. The proportion of wounds that were completely healed (that is fully re-epithelialised) at the end of the treatment period is reported in nine of the 11 studies. As shown in Table 5, only one study  observed a statistically significant larger proportion of healed wounds in the foam dressing-treated group (23 out of 50, 46%) than in those treated with the hydrocolloid dressing (15 out of 46, 33%) (p=0.045). Three other studies    reported higher proportions of completely healed wounds in patients assigned to treatment with foam dressings compared to those treated with hydrocolloids; however, the statistical significance of these findings are not included in the respective articles. The remaining five studies      did not detect any difference between the two dressing types in terms of the percentage of healed wounds. It is worth noting that, in one study , the mean age of the patients receiving treatment with the foam dressing was significantly higher than that of the group of patients treated with the hydrocolloid dressing (p=0.01); therefore the ulcers of patients randomised to treatment with the foam dressing would have been expected to take longer to heal. In terms of the time taken for wounds to heal, no significant differences between foam dressings and hydrocolloids were observed in the three studies that reported on this parameter   . As only one of the studies  which evaluated wound healing rates demonstrated a difference between the dressing types (in favour of foams), too much reliance should not be placed on its findings. Moreover, based on the reported confidence level (p=0.046), there is almost a 1 in 20 chance that this study found a statistically significant result when, in reality, no real difference exists. Bearing in mind the longevity of many leg ulcers and pressure ulcers, the adoption of treatment periods of insufficient length (for example, as short as two weeks in one instance)  is the most likely explanation for the low healing rates cited in Table 5. In view of this, it is worth highlighting that other wound-healing parameters were evaluated in a number of the studies. For example, at the end of an eight-week treatment period, Collier  observed a significant difference in wound condition between the two treatment groups: a 74% improvement in ulcer condition was recorded in the group of patients assigned to a foam dressing, compared to 50% in those treated with a hydrocolloid dressing (p≤0.05). In order to allow comparisons to be made for wounds which do not heal completely during the treatment period of a study, the mean percentage change in wound area at the time of each dressing change can be measured. In the study reported by Thomas et al , wounds treated with the foam dressing reduced in area more quickly than those in the hydrocolloid-treated group, although the result was not statistically significant. Significantly more leg ulcers treated with the foam dressing (44 out of 49, 90%) reduced in area compared to those treated with the hydrocolloid (33 out of 47, 70%) (p=0.028). Conversely, Charles et al  noted a non-statistically significant trend in favour of hydrocolloid dressings in their study. In the second of two studies reported by Bale et al , the percentage reduction in wound area was significantly greater for wounds assigned to treatment with foam dressings than in those treated with hydrocolloids (p=0.013). Dressing wear time is of importance to both patients and clinicians. Increased wear times are associated with fewer dressing changes, decreased procedure-related pain and reduced wound care costs in relation to nursing time and improved healing rates . Of the seven studies that reported on dressing wear time, four     indicated trends in favour of the foam dressings, compared to three    which revealed trends in favour of the hydrocolloid dressings: none of the differences were statistically significant, however. On a related theme, three of the identified articles    report on the number of dressings used during the treatment phase of the respective studies but found no statistically significant difference between the two dressing types. One of the factors that influence the wear time of a dressing is its ability to manage (absorb and retain) wound exudate. It is imperative that, in providing an optimum moist wound healing environment, dressings are used that achieve the delicate balance between an excess of wound exudate (which may lead to maceration) and the drying out of the wound (which could lead to cell and tissue death). It is important that dressings can also achieve this when used under compression in the treatment of venous ulcers, for example . Exudate from chronic wounds has been shown to be detrimental to the normal process of wound healing . It is thought that this is because chronic wound fluid contains high levels of proteases, which lead to a breakdown of wound and skin tissue matrix components . Exudate management is also relevant to patient quality-of-life issues. Failure to control exudate production will lead to leakage and malodour, as well as impacting on health economics, due to increased management costs and patient morbidity . The ability of foam dressings and hydrocolloids to manage wound exudate was evaluated in five of the identified studies     , including one evaluation in which the performance of the dressings under compression therapy was compared . In the earlier of the two studies undertaken by Bale and co-workers , dressing absorbency (assessed subjectively based on the researchers’ perceptions of the frequency of dressing changes and the level of dressing saturation) was rated as ‘good’ for 100 out of 124 (81%) of the foam dressings, compared to just 30 out of 117 (26%) of the hydrocolloid dressings. At the other end of the scale, none of the foam dressings were rated as having ‘poor’ absorbency compared to 26 out of 117 (22%) of the hydrocolloid dressings (Figure 2). In the same study, levels of absorbency in the group treated with foam dressings were significantly superior to the levels of absorbency associated with the hydrocolloid dressings (p<0.001). Soiling of clothes and bedclothes was reported in only five out of 125 (4%) cases in the group assigned to treatment with the foam dressing, compared to 29 out of 118 (25%) cases in the group treated with hydrocolloid dressings: this also reached statistical significance (p=0.002). Four of the other studies     reported on the proportion of dressing changes that were undertaken because of leakage and detachment. Thomas et al  observed that, at the first dressing change, 27 out of 50 patients with leg ulcers that were treated with a hydrocolloid dressing had their dressings removed because of leakage compared with seven out of 50 in those assigned to treatment with a foam dressing (p<0.0001). Similarly, leakage was significantly less frequent for patients with pressure ulcers in the foam-treated group (four out of 49), than in the hydrocolloid-treated group (15 out of 50) (p=0.007). Seeley et al  recorded leakage on only four occasions with a foam dressing compared to 23 occasions with the hydrocolloid dressing. In terms of actual patient numbers, leakage affected only one patient in the foam group and six patients in the hydrocolloid group (p=0.04), although there was no significant difference between the treatment regimens in terms of the number of wounds that became macerated or inflamed. In the first of two studies undertaken by Banks et al , the proportion of dressing changes undertaken because of leakage and detachment in the group assigned to treatment with foam dressings was 5% (leakage) and 44% (detachment), compared with 9% (leakage) and 53% (detachment) in those assigned to hydrocolloids. In the subsequent study by Banks et al , the proportion of dressing changes undertaken because of leakage and detachment was 27% and 25% respectively in those treated with foam dressings; in the group assigned to hydrocolloids, 5% of dressing changes were carried out because of leakage and 61% due to detachment. Bearing in mind that the two studies undertaken by Banks and co-workers   evaluated the same two dressings, it may seem a little surprising that the observed incidences of leakage and detachment varied so much between the two trials. Unfortunately, the authors do not offer an explanation for this but it may be relevant to note that the mean dressing wear times in the two studies were different (3.5 and 3.1 days for the foam and hydrocolloid dressings in the initial study  compared to 4.2 and 3.7 days for the foam and hydrocolloid dressings in the subsequent study ). All of the studies which evaluated exudate management properties demonstrated statistically significant differences between the two dressing types which strongly indicate that foams are generally able to cope with higher levels of wound fluid than hydrocolloids. The ability of a dressing to conform to the contours of a wound is important to reduce areas of non-contact where micro-organisms may proliferate . A dressing should also be sufficiently flexible and conformable to stay securely in place, even when applied to wounds in awkward locations, otherwise it will fail to provide effective exudate management, leading to leakage and the risk of maceration. In the one study that looked at conformability, the foam dressing was found to be significantly better at conforming to body contours than the hydrocolloid dressing (p=0.018) . Some 88% of applications (121 out of 138) were rated as conforming to body contours in the foam dressing-treated group, compared with 76% (99 out of 131) in the patients assigned to treatment with the hydrocolloid dressing . The proportion of applications rated as showing ‘good’ initial adhesion to the skin was 96% (132 out of 138) in the group treated with the foam dressing and 92% (121 out of 131) in those assigned to the hydrocolloid dressing. Tape bandages were used to secure the foam dressing on five occasions (4%) and on 38 occasions to help retain the hydrocolloid dressing (29%). If a dressing is easy to apply and remove, then it will generally take less nursing time to undertake dressing changes with that product than it would with one that is more difficult to use. This dressing characteristic, therefore, has economic implications for healthcare providers. Five studies included an evaluation of foams and hydrocolloids in terms of their ease of application     . Two studies   observed no significant different between the two dressing types. Collier  observed that a foam dressing was significantly easier to use than a hydrocolloid dressing (p<0.005), particularly during application. In another study , it was reported that both foam dressings and hydrocolloids were easy to apply in the majority of cases. The foam dressing was reported to be awkward to apply in five out of 29 patients (10 out of 138 dressing applications, 7%). The hydrocolloid dressing was awkward to apply in 11 out of 31 patients (24 out of 131 dressing applications, 18%). In the study reported by Seeley et al , 106 out of 107 (99%) dressings in the foam group and 87 out of 92 (95%) in the hydrocolloid group were assessed as being easy to apply. Conversely, one patient in the foam group and four patients in the hydrocolloid group experienced at least one difficult dressing application, but the difference was not significant (p=0.18). In addition to the economic implications described above, a dressing that is difficult to remove is likely to cause trauma to the wound and surrounding skin and, as discussed earlier, this can lead to increased wound-related pain, reduced quality of life for the patient, and delayed healing  . The ease of removal of the two dressing types has been compared in eight studies        . In the earlier of the two studies reported by Bale et al , the foam dressing was significantly easier to remove than the hydrocolloid (p<0.001) Dressing removal was reported as being ‘easy’ in 97% of cases (113 out of 117) in the foam group compared to 73% (85 out of 116) in the hydrocolloid group. Removal was reported as being difficult or awkward in 7% (eight out of 116) and 20% (24 out of 116) respectively for hydrocolloid dressings compared to 0% and 3% (4 out of 117) respectively for foam dressings (Figure 3). Similar observations were reported by Seeley et al . A total of 5/102 (5%) dressings in the foam group and 49/82 (62%) dressings in the hydrocolloid group were assessed as being difficult to remove. Statistically significant differences in favour of the foam dressings were observed with respect to the number of patients who experienced at least one difficult dressing removal (p<0.0001) and the time taken to change the dressings (p<0.001). The mean dressing change times were 7.6 minutes and 12.3 minutes for the foam and hydrocolloid dressing groups, respectively. In contrast, one study reported that approximately 60% of dressings with hydrocolloids took five minutes or less to complete, whereas 75% of those undertaken with foams took longer than five minutes to complete . While both foam and hydrocolloid dressing removal was rated ‘easy’ in the majority of cases at the first dressing change in the study reported by Thomas et al , more hydrocolloid dressings in the pressure ulcer group (85 out of 509, 17%) were rated ‘difficult to remove’ compared to foam dressings (11 out of 537, 2%) as the evaluation progressed. The foam dressings were shown to be significantly easier to remove in four other studies; three of which reported confidence levels of p≤0.005    and one which cited a confidence level of p≤0.016 . One study detected no difference between the two dressing types in terms of ease of removal . In terms of ease of application and removal, statistically significant differences in favour of foam dressings are reported in the majority (5/8) of the cited studies. On the other hand, no studies observed statistically significant differences in favour of hydrocolloid dressings. Overall, the available evidence strongly indicates that foam dressings are easier to use than hydrocolloids. As discussed earlier, dressing-related pain is a major concern to patients. For example, a cross-sectional, international survey of more than 2000 patients from approximately 15 countries revealed that more than 50% of respondents experienced pain at dressing change either ‘quite often’, ‘most of the time’, or ‘all of the time’. Forty-three per cent of those surveyed stated that pain at dressing change was the worst part of living with a wound . This important parameter was assessed in four of the identified studies    . In the first of the two evaluations reported by Banks et al , the foam dressing was associated with significantly less pain at dressing change (p <0.005); the proportion of patients experiencing pain-free dressing removal was 80% in the foam-treated group and 40% in the group treated with the hydrocolloid dressing. Although their second study did not detect a significant difference between groups in terms of pain on dressing removal, there were approximately 25% more pain-free dressing changes in the foam-treated group . 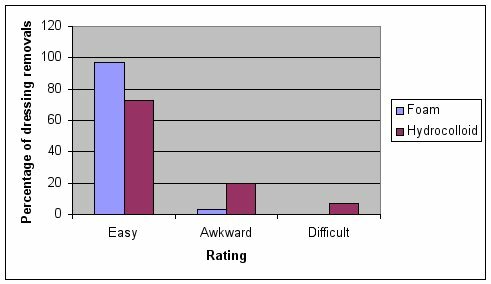 The authors offer no explanation for the difference in findings between their two studies but it is worth noting that there is nothing in the respective articles to indicate that the pain assessment method employed by the researchers involved a validated tool such as a visual analogue scale. Two other studies   detected no significant difference between the two dressing types in terms of pain on dressing removal and overall wound-related pain, but the former did reveal a slight, but not statistically significant, trend in favour of the foam dressing . Patients were asked to score on a scale of 1 to 4 (where 1 = very painful and 4 = no pain) if the dressings caused pain on removal. The mean score for the foam dressing was 3.72 and 3.63 for the hydrocolloid group . As none of the studies utilised validated pain assessment tools, the relevance of the results presented above is questionable. Dressing comfort is likely to contribute to patient concordance with treatment. In the first of two studies that measured patients’ subjective assessment of dressing comfort , participants were asked to score on a scale of 0 to 10 (where 0 = uncomfortable and 10 = very comfortable) according to whether they felt the dressings were comfortable while in place. The mean score for the foam dressing was 8.72 compared with 8.18 for the hydrocolloid dressing (difference not statistically significant). In the more recent study , it was noted that, at the first dressing change in patients with leg ulcers, the foam dressing was significantly more likely to be scored as comfortable than the hydrocolloid dressing (comfortable vs otherwise, p=0.023). In addition to the above, the proportion of dressing changes undertaken in the first of the two studies reported by Banks et al  because of patient discomfort was 21% in the foam-treated group and 34% in the hydrocolloid-treated group. Similar findings were observed in their second study : the proportion of dressing changes undertaken because of patient discomfort was 18% in the foam group, compared with 45% in the hydrocolloid-treated group. Interestingly, of the patients who were withdrawn from the study, two were withdrawn due to discomfort in the hydrocolloid group and none in the foam group. Unfortunately, no statistical analyses of these observations are reported. The management of malodour in fungating wounds and chronic ulcers presents a number of challenges, not least of which is the impact it may have on the quality of life of patients . This issue was considered in the design of three of the identified studies   . For example, Collier  observed that odour levels at dressing change were significantly lower in the foam dressing-treated group than in those treated with the hydrocolloid dressing (p<0.005); of particular note is that odour was absent at over 70% of dressing changes on the foam-treated group, compared with under 40% of those treated with the hydrocolloid dressing. Thomas et al  noted that, at the first dressing change in patients with leg ulcers, the foam dressing was significantly less likely to produce odour than the hydrocolloid dressing (no odour vs otherwise, p=0.023. The third study  did not observe a significant difference in wound odour between groups (p=0.11). The mean wound odour value was 0.16 and 0.47 for the foam and hydrocolloid groups respectively (scored as 0 = none, 1 = mild, 2 = moderate, 3 = severe). These findings are consistent with other reports in the literature that refer to some hydrocolloid dressings interacting with wound exudate, resulting in liquefied material that is frequently associated with malodour, can resemble pus and may cause leakage, all of which can cause great distress to patients  . For these reasons, it has been argued that foam dressings are a better choice than hydrocolloid dressings for exudating and/or malodorous wounds . In the first of two studies reported by Bale and co-workers , there was no report of foam dressing removal causing damage to the wound, but there were three such reports in the group treated with the hydrocolloid dressings (3%). There were three cases of damage to the surrounding skin reported in the group treated with the foam dressing (2%); this compared favourably to the eight reports in the group assigned to the hydrocolloid dressings (7%). More recently, Karlsmark  and Zillmer et al  reported on the results of a randomised controlled trial involving 45 patients with venous leg ulcers that specifically set out to determine the effect of repeated removal of four different dressings on peri-ulcer skin. The test products included: a foam dressing with hydrocolloid adhesive, a hydrocolloid dressing with hydrocolloid adhesive, a foam dressing with soft silicone adhesive and a foam dressing with polyurethane adhesive. Adhesive patches of the dressings were replaced every second day over a two-week period. Skin barrier function and stratum corneum hydration were assessed by measuring transepidermal water loss (TEWL) and electrical conductance, respectively. As shown in Figure 4, peri-wound skin treated with hydrocolloid-based adhesive dressings was associated with significantly increased TEWL and conductance (see Fig 4 for details), compared with non-treated peri-ulcer skin. By comparison, the foam dressings with soft silicone and polyurethane adhesives did not have any significant effect on TEWL and conductance. These findings, which are very much in line with those obtained from a series of volunteer studies   , indicate that hydrocolloid dressings or products incorporating hydrocolloid adhesives have a tendency to damage both the wound bed and the skin surrounding wounds. Three studies reported on dressing-related adverse events   . In the first of these studies , seven patients in the hydrocolloid dressing group and 10 in the foam dressing group were reported to have experienced adverse events that suggested a link to the dressing. Most frequently, these related to problems with the adhesive nature of the dressings causing minor trauma or areas of erythema on removal. In addition, other minor dressing-related events were observed. For example, maceration occurred in ten patients in the hydrocolloid group. Maceration was not reported for any wounds in the foam group. Bleeding from the wound area was reported in three patients in the hydrocolloid group. No bleeding was recorded in the foam group. Wound dehydration and problems with dressing adhering to the wound surface were encountered in two patients in the foam group but no such problems were encountered in the hydrocolloid group. Excess granulation tissue developed in three patients in the hydrocolloid group. No excess granulation tissue was recorded in the foam group. In relation to the latter finding, it is worthy of note that, in the second of two studies reported by Banks et al , 10% of the patients treated with hydrocolloid dressings were withdrawn due to overgranulation of the wound. A study in which overgranulating wounds were treated with a foam dressing demonstrated a decrease in height of 2mm of granulation tissue from initial measurements to measurements taken two weeks later (p<0.01) . In the two other studies that refer to dressing-related adverse events, Seeley et al  described one patient in the foam-treated group who developed blisters beneath the adhesive border and two adverse events in the hydrocolloid group in which the edges of one patient’s ulcer became macerated, while the other patient developed a rash beneath the dressing. Finally, Bale et al  describe just one adverse event, a localised skin rash in a patient treated with a foam dressing. A number of studies have compared patient-centred outcomes associated with the use of foam and hydrocolloid dressings. Some did not demonstrate significant differences between the two dressing types: this could be due to the general accepted view that it is very difficult to demonstrate clear differences between wound dressings in small-scale clinical trials or it could reflect that there is no real difference between certain dressings. Either way, it is just as important to point out that for each of the parameters discussed above (dressing-related pain, patient comfort, wound odour, and dressing-related trauma), significant differences in favour of foam dressings have been observed but not for hydrocolloids. While this article does not attempt to provide an in-depth critique of the design and methodology of each of the studies described earlier, it is important to point out a number of deficiencies with them. For example, although all the studies were designed as RCTs, the method of randomisation was not stated for three of them   . Furthermore, full randomisation was not possible in one of the studies . On this basis, it is important to bear in mind that poor methodology could account, at least in part, for the wide variation in the clinical observations. Another criticism that could be levelled at a number of the studies is the size of the respective study populations. For example, in the first of the studies undertaken by Banks et al  and the clinical evaluation described by Edwards et al , the study populations were 29 and 30, respectively. It is generally accepted that it is extremely difficult to design clinical studies to detect differences between wound care interventions, particularly in the case of those involving relatively small patient populations. In considering the findings of the cited studies, it is important to bear in mind that foams and hydrocolloids are broad categories and that there are significant differences between the characteristics of dressings within these categories. Furthermore, it is not uncommon for dressings to be redeveloped so that some of those evaluated in the identified studies may now have been replaced by improved versions. It could also be argued that, in certain situations, foam and hydrocolloid dressings are not directly comparable. For example, hydrocolloids may offer some advantages over foam dressings in the management of dry wounds, whereas foam dressings may offer some advantages over hydrocolloids in the treatment of exuding wounds . Nevertheless, this article has identified that there would appear to be important differences between foam dressings and hydrocolloids in terms of their in-use characteristics (such as exudate management) and patient-centred characteristics (such as the severity of trauma and pain associated with their removal). While most clinicians would argue that both foams and hydrocolloids satisfy many of the characteristics of an ‘ideal’ dressing, this literature review indicates that there are a number of studies assessing clinical performance in which foam dressings outperform hydrocolloids, although there are other studies in which the dressings appear to be comparable. The explanation for this may be due to the wide range of products used in these studies, which may exhibit clinically significant differences within the product groups. Only one study demonstrated a significant difference between the two dressing types in terms of wound healing rates ((in favour of foam), but due to the number of studies showing no significant difference, this is possibly a statistically anomaly arising by chance. However, a number of comparative studies have highlighted that foam dressings are superior to hydrocolloids in terms of exudate management and in-use characteristics (such as ease of use, ease of removal and conformability) in the treatment of exuding wounds although other studies report no real difference between the two product types. This paper highlights the importance of considering the likely effects of different dressing types not only on the actual wounds, but also on patients. The ability of dressings to help maintain (and improve) the quality of life of patients is something that clinicians must not overlook when it comes to dressing selection. 1. Winter GD. Formation of the scab and the rate of epithelialisation of superficial wounds in the skin of the young domestic pig. Nature 1962; 193: 293-4. 2. Thomas S. A structured approach to the selection of dressings. World Wide Wounds 1997; Available from URL: http://www.worldwidewounds.com/1997/july/Thomas-Guide/Dress-Select.html. 3. Thomas S. The role of dressings in the treatment of moisture-related skin damage. World Wide Wounds 2008; Available from URL: http://www.worldwidewounds.org/2008/march/Thomas/Maceration-and-the-role-of-dressings.html. 4. Morris C. Foreward. In: Evidence Review: The clinical benefits of Safetac® technology in wound care. London: MA Healthcare, 2008; 3. 5. Hollinworth H, White R. The clinical significance of wound pain. In: White R, Harding K, editors. Trauma and Pain in Wound Care. Aberdeen: Wounds UK, 2006; 3-16. 6. Rippon M, White R, Davies P. Skin adhesives and their role in wound dressings. Wounds UK 2007; 3(4): 76-86. 7. Soon K, Acton C. Pain-induced stress: a barrier to wound healing. Wounds UK 2006; 2(4): 92-101. 8. Vileikyte L. Stress and wound healing. Clinics Dermatol 2007; 25(1): 49-55. 9. World Union of Wound Healing Societies. Principles of Best Practice: Minimising Pain at Wound Dressing-related Procedures. A consensus document. Toronto: WoundPedia Inc, 2007. 10. Fatz D. New Horizons in Wound Management. London: Informa UK, 2004. 11. Moreau D. Wound Care Made Incredibly Easy. Philadelphia: Lippincott, Williams & Wilkins, 2003. 12. Moragn DA. Formulary of Wound Management Products: A guide for healthcare staff (ninth edition). Haslemere: Euromed Communications, 2004. 13. Collier J. A moist, odour-free environment. A multicentred trial of a foamed gel and a hydrocolloid dressing. Prof Nurse 1992; 7(12): 804-8. 14. Bale S, Hagelstein S, Banks V, Harding KG. Costs of dressings in the community. J Wound Care 1998; 7(7): 327-30. 15. Bowszyc J, Bowszyc-Dmochowska M, Kazmierowski M, Ben-Amer HM, Garbowska T, Harding E. Comparison of two dressings in the treatment of venous leg vulcers. J Wound Care 1995; 4(3): 106-10. 16. Thomas S, Banks V, Bale S, Fear-Price M, Hagelstein S, Harding KG, et al. A comparison of two dressing in the management of chronic wounds. J Wound Care 1997; 6(8): 383-6. 17. Charles H, Callicot C, Mathurin D, Ballard K, Hart J. Randomised, comparative study of three primary dressings for the treatment of venous ulcers. Br J Community Nurs 2002; 7(6 Suppl): 48-54. 18. Karlsmark T. Dressing adherence to skin: a clinical evaluation in venous leg ulcer patients. World Wide Wounds 2006; Available from URL: http://www.worldwidewounds.com/News/News.html. 20. Banks V, Bale SE, Harding K. The use of two dressings for moderately exuding pressure sores. J Wound Care 1994; 3(3): 132-4. 21. Banks V, Bale SE, Harding KG. Comparing two dressings for exuding pressure sores in community patients. J Wound Care 1994; 3(4): 175-8. 22. Bale S, Squires D, Vamon T, Walker A, Benbow M, Harding KG. A comparison of two dressings in pressure sore management. J Wound Care 1997; 6(10): 463-6. 23. Seeley J, Jensen JL, Hutcherson J. A randomized clinical study comparing a hydrocellular dressing in the management of pressure ulcers. Ostomy/Wound Management 1999; 45(6): 39-47. 24. Edwards H, Gaskill D, Nash R. Treating skin tears in nursing home residents: a pilot study comparing four types of dressings. Int J Nurs Prac 1998; 4(1): 25-32. 25. Campbell KE, Keast D, Woodbury G, Houghton P. Wear time in two hyddrocolloid dressings using a novel in-vivo model. Wounds 2003; 15(2): 40-8. 26. Cutting KF. Wound exudate: composition and functions. Br J Community Nurs 2003; 8(9 Suppl): 4-9. 27. Wysocki AB, Kusakabe AO, Chang S, Tuan TL. Temporal expression of urokinase plasminogen activator, plasminogen activator inhibitor and gelatinase-B in chronic wound fluid switches from a chronic to acute wound profile with progression to healing. Wound Repair Regen 1999; 7(3): 154-65. 28. White R, Cutting KF. Modern exudate management: a review of wound treatments. World Wide Wounds 2006; Available from URL: http://www.worldwidewounds.com/2006/september/White/Modern-Exudate-Mgt.html. 29. Jones S, Bowler PG, Walker M. Antimicrobial activity of silver-containing dressings is influenced by dressing conformability with a wound surface. Wounds 2005; 17(9): 263-70. 30. Price PE, Fagervik-Morton H, Mudge EJ, Beele H, Ruiz JC, Nystrøm TH, et al. Dressing-related pain in patients with chronic wounds: an international patient perspective. Int Wound J 2008; 5(2): 159-71. 31. Morris C. Wound odour: principles of management and the use of CliniSorb. Br J Nurs 2008; 17(6 Suppl): S38-S42. 32. Thomas S. Making sense of … hydrocolloid dressings. Nurs Time 1990; 86(45): 36-8. 33. Milward P. Examining hydrocolloids. Nurs Time 1991; 87(36): 70-4. 34. Brett DW. Impact on exudate management, maintenance of a moist wound environment, and prevention of infection. J Wound Ostomy Continence Nurs 2006; 33(6 Suppl): S9-S14. 35. Dykes PJ, Heggie R, Hill SA. Effects of adhesive dressings on the stratum corneum of skin. J Wound Care 2001; 10(2): 7-10. 36. Dykes PJ, Heggie R. The link between the peel force of adhesive dressings and subjective discomfort in volunteer subjects. J Wound Care 2003; 12(7): 260-2. 37. Dykes PJ. The effect of adhesive dressing edges on cutaneous irritancy and skin barrier function. J Wound Care 2007; 16(3): 97-100. 38. Harris A, Rolstad BS. Hypergranulation tissue: a nontraumatic method of management. Ostomy/Wound Manage 1994; 40(5): 20-30. 39. Thomas S. Hydrocolloid dressings in the management of acute wounds: a review of the literature. Int Wound J 2008; 5(5): 602-13.